Amanda Parker provides this month's excellent article and can tell us not only something about keeping this attractive pleco, but also how she looked after the fish to the point where they happily reproduced and raised fry. 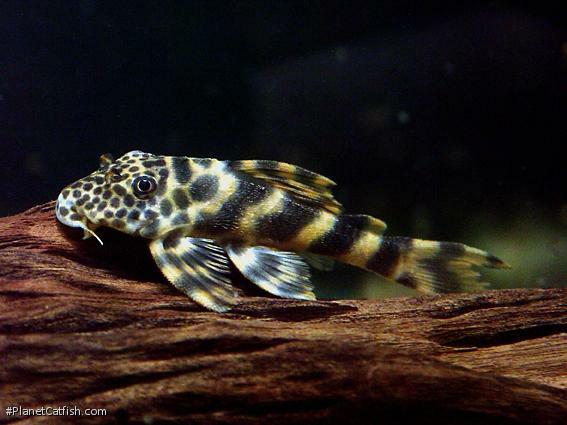 The L387 Loricariid catfish, possibly a Peckoltia species, is undescribed at this time. It is likely from Colombia, but the exact type locality has not been made known. There are similar species: the L205, the L208 and a host of others which range from 3"-5.9" standard length and have similar coloration: typically alternating orange and brown/black stripes starting at the caudal fin which move through the body and transition to brown/black head spots with an orange background. The L387s in my care are likely young and may have a bit of growing left to do. They are 3-1/2"SL and very brightly colored. It will be interesting to see if they maintain their bright colors as they age and continue to breed. It has been noted that some species like this lose their bright colors as they age. A good example of this is the L147. The water in their 20 gallon long tank ranges from 6.8-7.0 pH (RO water) with a temperature of 78-81°F. The water is on the soft side (less than 200 microSeimens per cm) and a high oxygen level is required (airstones do the trick). For one month, I used tap water, but their colors soon faded and their appetites waned. When I switched back to RO water, their colors and appetites reappeared. They bred for the first time 7 days later. This may have been one factor in their spawning or it may have been a coincidence. There might have been a multitude of factors that induced their spawning, including the time of year (March-April), a 60% water change with pure RO water, a large change in air pressure and possibly the largest factor, fish maturation. It took 18 months from the time I brought them home until they bred. The group grew an average of 1" SL in the 18 months time and added a large amount of girth. So much that differing boys from girls became difficult. When I first brought them home, it was a bit easier to distinguish the sexes: 2 males and 1 female. One was thicker through the middle and had duller colors. Then, as they matured, all 3 took on the same appearance. I wasn't so sure. The genital papilla method was unreliable. I came up with 1 male, 1 female and 1 uncooperative. Another interesting aspect of the L387 is their feisty behavior. This is not your average placid species you purchase to graze on algae. I had to remove one fish for a short period of time to be treated for bites. I rearranged the tank furnishings prior to reintroducing the fish. This worked well. It seemed 2 male fish wanted the same cave. I even observed territorial behavior in fry just out of the cave: head nips. Most behaviors seem to be territorial and are exhibited by head nipping, tail swatting and rare fights, especially among fry and juveniles. The first sign is the 2 fish face each other. Then, head nipping occurs. Among fry and juveniles, it seems to stay mostly nipping and shoving. The fights seemed to occur when the adults were first introduced to the 20 gallon long and a cave was awaiting claim. This brings me to their tank layout. To diffuse the territorial behavior, I introduced three caves and three pieces of driftwood with Java Moss attached for three fish. This made for many hiding places and diffused 90% of the behavior. The substrate is a mix of sand and clay, which I use in most of my planted tanks. I had the misconception that I would be able to keep a plant rooted with these fish present. I was mistaken. The very first layout contained some plants with roots. All plants became floating plants within the hour. Interestingly, the L387s like to chew on the clay substrate. 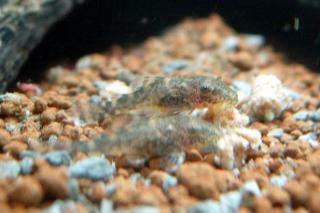 The fry and juveniles also like to chew on this kind of substrate. This has advantages and drawbacks. The advantages include nutrition from Aufwuchs/biofilm that grows on the substrate. A major disadvantage is the mess this creates. The substrate becomes a pulverized powder which clouds the water with particulate matter. A filter impeller can become clogged very quickly, too and requires cleaning on a regular basis. If you prefer crystal-clear water, a substrate free tank may be preferable. However, these fish do produce a fair amount of waste and good filtration is a must. For the adults, sponge filtration didn't come close to working for 2 reasons. The first reason was they thought the sponge was a chew toy. This species has some nice teeth. The second was inadequacy, especially with substrate combined with their waste production. I prefer an oversized hang-on-the back filter. Other options would be canister filtration or in-line filtration. Feeding the L387 is relatively easy. This is a true omnivore and leans to the carnivorous side. It will accept the occasional piece of zucchini, but it first eats the seeds. If there are no seeds, it ignores the zucchini completely. The seeds can easily get stuck in the filtration, so I don't feed it often. The juveniles seem to like the vegetable matter more than the adults. They also go for the seeds first. Foods eagerly accepted are aufwuchs/biofilm, driftwood, crushed flake food, sinking wafers (meat and veggie), brine shrimp, daphnia, Cyclops and shrimp pellets. The shrimp pellets are a favorite of the juvenile L387s and will carry one by mouth to a remote spot in the tank to eat in peace, until a tankmate finds him and will defend his food. This species has strong teeth and an even stronger will. The actual breeding was unremarkable. I looked one day and there were 2 tails sticking out of 1 cave. The act was reminiscent of the Corydoras "T" position. The mating clinch lasted for 5-6 minutes, which is much longer than a Corydoras species clinch. The male kicked the female out of the cave. 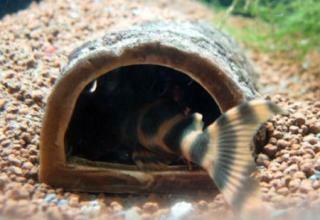 She attempted to re-enter the cave, but was very gently blocked by the male's caudal fin. She gave up after 2 feeble tries and went back to her previous territory and kicked up substrate with her caudal fin, a normal behavior. For such a territorial fish, the breeding act was quite calm. I've seen Ancistrus pairs mate more aggressively. During gestation, the male sways his caudal and ventral fins for several weeks (more than 2) to keep the area clean. This goes on until the fry's yolk sacs are exhausted and they can feed on their own. The first brood was 20 fry. The second brood was 50 fry. They are surprisingly large, not just in length, but in girth, when they leave the cave. They are 3/8" TL and quite wide. Their color is a dull gray. It takes two more weeks before they exhibit the orange and brown/black colors with head spots and the caudal fin bifurcation. For their initial week out of the cave, Aufwuchs/biofilm is their food of choice. Then, zucchini (for the seeds), crushed flake foods and shrimp pellets are added to the rotation. They grow at a remarkable rate and look like miniature replicas of their parents by 2-1/2 weeks out of the cave. By 4 weeks out of the cave, the juveniles are 1" total length. Adult L387s will not harm new fry out of the cave. In fact, they seem to protect them and will take them into their caves. Even the females will take fry into her territory. The older juveniles will crowd out the younger fry for food. I've found it better to remove the older juveniles as the males are getting ready to release a new brood. This is my first encounter with a species that shows some territorial behaviors. If I had known this species was territorial prior to purchase, I wouldn't have taken the risk. Now, I have a small amount of experience with this type of behavior and would take the risk again. The L387 makes a nice alternative to some of the other L-number catfish out there, but it isn't the only one. There are hundreds of these species out there. If you see a group of fish priced to sell because they aren't common or identified, take a chance. Keep good notes as you go. Put aside a tank, pack your patience (not just months, but possibly years) and see what happens. The rewards are incredible.